Puglia hosts numerous castles and medieval fortresses dating back to the 11th century and are a popular visit and trip among the visitors from all over the world to the southern Italy region. Castles are open to visitors often for no entrance fees as well, or they are housing art galleries or museums. Many of Puglia’s castles are preserved and protected areas: for example the very famous Castel del Monte, open all year round and built in 1240 by Frederick II, well-known for its unusual octagonal shape and its architecture! A combination of classical Islamic and European Gothic styles, the castle is made up of a crown-like ring made of rooms and buildings. The rooms are all connected and there is a huge central octagonal courtyard.It is not a secret that this castle one of southern Italy’s UNESCO world heritage site. The castle has a low entrance fee and it takes just an hour to visit it. The closest town? Andria with its 18 kilometers away. In the area you can visit several “masserie”, beautiful manor houses, where you can overnight. Another gem is the Norman-Swabian castle (Castello Svevo) in Bari, the Puglia “capitale” called the Swabian Castle. Built by the Norman King Roger II in 1131 and later rebuilt by Frederik II, the castle has a working drawbridge and numerous ramparts. The Museum of Gypsum Works, sculptures and artifacts of Puglian history but also temporary art exhibitions are displayed here. This waterfront castle is near the harbor, just outside the beautiful and renovated Bari’s “citta’ vecchia”, that is the old town center. This glorious castle functioned as a guard for the city from the attacks of the pirates and the other armies. 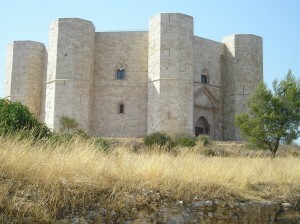 In Bisceglie there is a 27 meter high Norman tower surrounded by walls. Built by Count Peter I in 1060, while the Normans originally constructed only the first floor, it was added later the castle as a last refuge for local inhabitants. The fisherman call the tower the Torre Maestra as it has been used by seafarers as a guide for ships. You will find now in the castle an ethnographic museum. This entry was posted on Saturday, June 9th, 2012 at 5:22 pm	and is filed under Discover Italy. You can follow any responses to this entry through the RSS 2.0 feed. You can leave a response, or trackback from your own site.